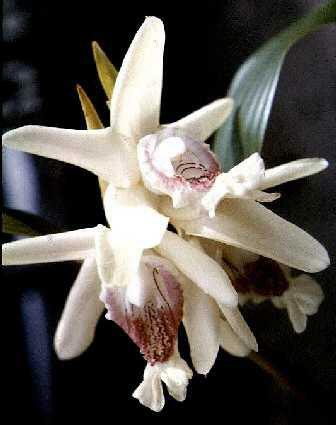 Sobralia undatocarinata C. Schweinf. 1938 Photo by Dr Leslie Garay, Copyright © , and the Dr Leslie Garay Archives. Found in Costa Rica and Panama in pluvial oak forests at elevations of 1100 to 2700 meters as a large to giant sized, cool to cold growing terrestrial or occasional epiphyte with erect, thick, slightly verruculous stems carrying several, elliptic, acuminate, coriaceous, strongly plicate leaves that blooms in the summer and early fall with a terminal, 2.8 to 3.2" [7 to 8 cm] long, inflorescence with loose floral bracts carrying 2 to 5 simultaneous opening, white flowers with a red lined lip that last several days.